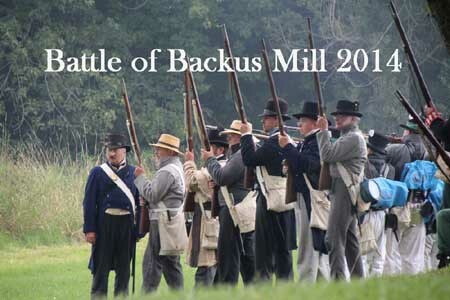 Backus Mill is one of IMUC’s favourite annual events. The site visually, is one of the best we attend. Years ago we offered to portray Americans so that the host group – The Norfolk Militia – could portray redcoats in their own back yard. Again this year we portrayed the Incorrigible Malcontents of Upper Connecticut during the Saturday battles, helping the US forces win. On Sunday we returned to the Crown Forces in Red and won yet again! It worked for us!! We would like to thank Backus Mill for again treating us so well. Robin De Cloet and all her staff and volunteers are the best!! On Saturday, our Campfollowers pulled off a full turkey dinner for 50 plus members. Turkeys were cooked perfectly in doubled dutch ovens in a well attended pit of hot coals! Well done all! 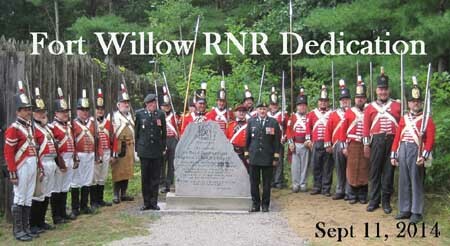 The Incorporated Militia along with Bolger's and Skinner's Companies of the RNR were present for the unveiling of the monument dedicated to the "Royal Newfs" who served at the Willow Depot on Nine Mile Portage. This important Military Depot was on the main supply route to Lake Huron and the west. Local residents, politicians and the Friends of Fort Willow attended the presentation. The Friends of Historic Fort Willow dedicated a memorial to the men of the Royal Newfoundland Fencible Infantry who, in early 1814 marched to that place from Kingston, built 39 batteaux and sailed with 60 tons of supplies to Mackinaw Island, preserving the North West for Britain and her Native allies. Lt Col. Allen Heale, CO of the First Battalion, Royal Newfoundland Regiment was present for the unveiling. Following the official ceremonies we set up camp inside the fort and prepared for the school day with over 800 students, teachers and parents attending. Members of the Royal Navy, The Nancy Gun Crew, The Canadian Volunteers, The King's Loyal Native Allies, the US 19, the King's loyal sutlers and craftsmen Joined the "Newfs" and IMUC demonstrating a true living history program to the visiting students. We would like to thank the Town of Minesing, The Friends of Fort Willow and The Royal Newfoundland Regiment for again inviting us to come and help out for the Festival. The Glengarry Pioneer Village is located in Dunvegan Ontario and was the destination this weekend for the Incorporated Militia's "Expeditionary Force!" This crossroad north of Cornwall was the site of the recruiting for the original Glens. Jim Mullin is the organizer of this event and did a great job making everyone feel welcome, again! Last year we almost floated away due to non stop rain! This year Jim arranged for the weather to be perfect!! Also in attendance were some of the Fensibles, The Votegeurs and the Royal Dragoons. These groups also stuck around Monday to help with the Education Day for the kids of the local schools. Again the weather was perfect and everyone, re-enactors and kids had a great time. Upper Canada's oldest pub is located in the village. Local craft beer was served. We were to bring our own mugs and some members definitely took advantage of the offer! Two of our Campfollowers, Doreen and Marianne had their cameras working for us. We were also able to glean some other pictures from Facebook.